Get fit. Be fit. Stay fit with CrossFit, a high intensity workout that targets the whole body. It’s fun and engaging while at the same time building fitness levels. Find a local “box” and jump, pull, run, row or squat your way to a healthier you. Here are the best CrossFit gyms in Colorado. Exercising at any altitude is challenging, but at 9,000 feet it takes fitness experts who know how to help navigate high altitude challenges. You’ll find them here. The program incorporates a wide-range of activities that include gymnastics, sprinting, jumping rope and weightlifting. For newbies, there’s an On-Ramp program that teaches basic movements in preparation for the next level of intensity. Open every day. Drop-ins welcome. Open year-round, this 7,200-square-foot training center is a place for everyone—regardless of age or fitness level. All new cross fitters get three free sessions, just to be sure about the program before beginning. A fundamentals program is next and then the program kicks into high gear with WOD, or Workout of the Day, which builds fitness through fun and challenging classes. Other services include weekly massage therapy, yoga classes and an on-site barbell club. Clinics and workshop take place throughout the year. This is not your typical gym, an admission from the fitness gurus here. It’s not a spa, but a place to work out, sweat, grunt, achieve, excel and become fitter and healthier. The focus is to train for a healthy life outside the gym, accomplished through a commitment to push your body hard while at the same time having fun. An “alkaline” state references a commitment to a specific nutrition plan followed here. All levels of ability will find a workout that’s just right for them. Membership, as well as drop-in program available. If you’re looking for a fitness program where the trainers cheer, push, encourage and inspire you to have fun, lose weight and sleep better then sign-up here. The initial nine session course provides exercise technique and nutrition guidance. After that, choose from a selection of more than 30 weekly classes that include not just fitness, but weight training, endurance and yoga opportunities. You’ll become part of a community of likeminded people who want to be healthy and strong and get in shape for life’s challenges when you attend classes here. 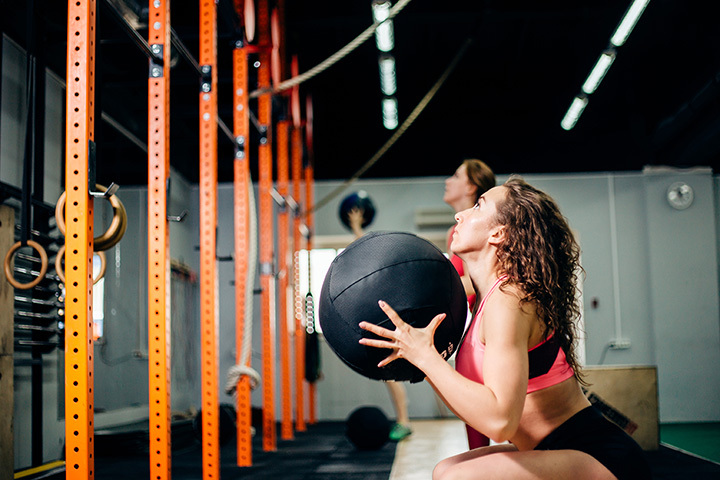 In addition to CrossFit classes, take part in an intense boot camp or get started with a personal trainer. There’s a safe and fun area for children to hang out while parents are working out. This gym gamily is focused on helping members make good, healthy choices. Join as a member and gain access 24 hours-a-day to a multitude of fitness opportunities. There’s a cross training alley, weight and cardio rooms, racquetball and basketball courts, abs and stretching room, boxing corner, Olympic lifting area and, seasonally, an outside gym. Take a spin, cycling, Pilates or yoga class. Achieve personal goals with a certified personal trainer and some one-one-one coaching. What seems impossible when you start, will “soon become your warm-up”—say the trainers! Try a free week of classes at this low-pressure gym to make sure it’s a good fit before even committing to a long-term program. Chances are you’ll be so hooked on the program you’ll jump in to it full bore. The atmosphere, welcoming and motivating, is a good balance to the strenuous fitness demands. All skill levels are catered to. At the gym, open every day, there’s a full schedule of classes that support physical improvement and growth. The gym, owned and operated by a military veteran, has special discounts for all veterans. Schedule a no-sweat intro to set some goals on how to get to the fitness level you want for yourself. That may be the easy part, but the results of signing up for a cross fit program are worth the work. It’s an hour-long blend of weightlifting, gymnastics and traditional cardio workouts combing with expert coaching. Jai, a Sanskrit word, translated means victory. After a few sessions, you’ll discover your inner athlete and good health will be the victorious result. The left hand does indeed know what the right hand is doing at this 7,000-square-foot facility. All the coaches are on the same page—customizing workouts so that each member reaches their personal goal. You’ll find a weight lifting area, as well as a strength and conditioning room. Begin with the one-on-one on-ramp program that teaches fundamentals before moving into more advanced classes, that focus on small group training. Special pricing for students. Bring a friend and save, too. Crank up the music while you work out—it’s ok, this is a place for weightlifters who are music lovers or vice versa to come together to get fit. Stash your guitar, banjo or harmonica in your gym bag for a jam session after training. Give it a try for two weeks, a maximum of 10 classes with no obligation to join. Membership brings with it access to all Workout of the Day classes. Time is spent on proper movement instruction—it might even help on the dance floor!